The 44th FIAC, one of the world’s leading art fairs, will be held in Paris from Thursday, October 19 to Sunday, October 22, 2017, in the historical Parisian venue, the Grand Palais. The vernissage will take place on Wednesday, October 18. The fair will present 193 of the world’s most prestigious modern and contemporary art galleries from 30 countries. They will be deployed in the exceptional spaces of the Grand Palais: the Nave on the ground floor together with the Salon d’honneur, the Salon Jean Perrin and the Upper Galleries on the first floor. Beginning in 2004, FIAC was the first art fair in the world to feature a design sector. We are happy to announce the return of design to the fair this year, with the presence of five of the leading French galleries in the field: Jousse Entreprise, Galerie kreo, LAFFANOUR – Galerie Downtown, Eric Philippe, and Galerie Patrick Seguin. Among its participants, FIAC is also pleased to present a selection of galleries specialized in edition. scene with the highly reputed Lafayette Sector. Conceived by the Galeries Lafayette and FIAC, this programme will bring together 10 galleries selected for the high quality of their prospective exhibition programmes, and on the basis of a specific project featuring one or two artists. The On Site sector, launched in 2016, presents some forty sculptures and installations in the prestigious setting of the Petit Palais and on Avenue Winston Churchill, pedestrianised for FIAC. This sector is organised in close association with Christophe Leribault (curator in chief and director, Petit Palais, Paris) and co-curated by Eva Wittocx (curator, M Museum, Leuven). Featured in this sector are works by Arman (Georges-Philippe & Nathalie Vallois), Peter Buggenhout (Laurent Godin and Konrad Fischer), Vlassis Caniaris (Peter Kilchmann), Claude Closky (Laurent Godin), Johan Creten (Almine Rech), Koenraad Dedobbeleer (ProjecteSD), Ida Ekblad (Max Hetzler), Anna Fasshauer (Nagel Draxler), Barry Flanagan (Waddington Custot), Yona Friedman (Jérôme Poggi), Sheila Hicks (frank elbaz), Nicholas Hlobo (Lehmann Maupin), Martin Honert (Esther Schipper), Kim Yong-Ik (Kukje Gallery / Tina Kim Gallery), Justin Matherly (Paula Cooper), Matt Mullican (Mai 36, Peter Freeman Inc, Capitain Petzel, ProjecteSD), David Nash (Lelong & Co.), Otobong Nkanga (In Situ – Fabienne Leclerc), Richard Nonas (Fergus McCaffrey), Mikayel Ohanjanyan (Tornabuoni Art), Claudio Parmiggiani (Meessen De Clercq and Simon Lee), Françoise Pétrovitch (Semiose), Falke Pisano (Ellen de Bruijne Projects), Enrique Ramirez (Michel Rein), Pablo Reinoso (Waddington Custot), Fabrice Samyn (Meessen De Clercq), Hans Schabus (Jocelyn Wolff), Seung-taek Lee (Hyundai), Alina Szapocznikow (Loevenbruck), Antoni Tàpies (Lelong & Co.), Barthélémy Toguo (Lelong & Co.), Joëlle Tuerlinckx (Nagel Draxler and Nächst St. Stephan Rosemarie Schwarzwälder), Wang Wei (Edouard Malingue), Lisa Williamson (Shane Campbell), Erwin Wurm (Thaddaeus Ropac). 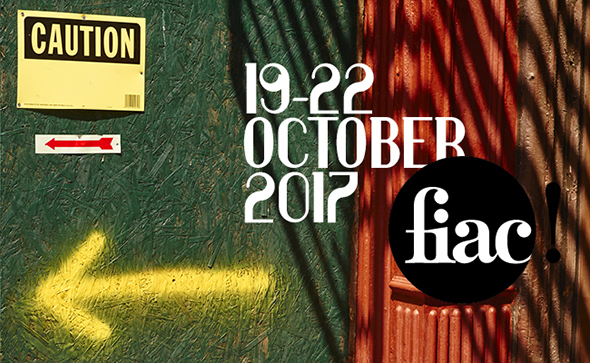 FIAC reaffirms its strong commitment to culture, readily accessible to all, through the Hors les Murs programme. This ensemble of exhibitions of unrivalled calibre within the landscape of international art fairs will be presented in emblematic Parisian locations. This year, FIAC presents some thirty projects in the Tuileries Garden (view artworks list), a solo exhibition of Katinka Bock (Jocelyn Wolff, Meyer Riegger and Greta Meert) in the Musée national Eugène-Delacroix, and a carte blanche to the American artist Oscar Tuazon (Chantal Crousel, Eva Presenhuber and Luhring Augustine) on the Place Vendôme. The Tuileries Garden selection committee consists of teams from the musée du Louvre, headed by Vincent Pomarède (Curator in Chief and Director of Cultural Outreach and Programming, musée du Louvre, Paris), as well as Bernard Blistène (Director, Centre Pompidou, Paris) and Jean de Loisy (President, Palais de Tokyo, Paris). Discover artworks and monumental installations by Gilles Barbier (Georges-Philippe & Nathalie Vallois), Julien Berthier (Georges-Philippe & Nathalie Vallois), Mel Bochner (Simon Lee), Hera Büyüktaşcıyan (Green Art), Antonio Caro (Casas Riegner), Los Carpinteros (Peter Kilchmann, Solo Galerie), Ali Cherri (Imane Farès), George Condo (Skarstedt), Marc Couturier (Laurent Godin), Folkert de Jong (Valentin), Jean Denant (Anne de Villepoix), Erik Dietman (Ceysson & Bénétière and Galerie Papillon), Jim Dine (Templon, Manufacture de Sèvres), Maria Elvira Escallón (mor charpentier), Ryan Gander (gb agency), Navid Nuur (Martin van Zomeren, Max Hetzler, Plan B), Marta Pan (Galerie Mitterrand), Christian de Portzamparc (revolution precrafted), Jean Prouvé (Patrick Seguin), Pugnaire & Raffini (Ceysson & Bénétière), Stefan Rinck (Semiose, Sorry We’Re Closed), Stéphanie Saadé (Anne Barrault), Patrick Saytour (Ceysson & Bénétière), João Vasco Paiva (Edouard Malingue), Claude Viallat (Ceysson & Bénétière). FIAC will also present its performance festival Parades for FIAC (view complete programme), together with a conference cycle organised with 89plus in the Conversation Room of the Grand Palais and a film programme with the Fondation d’entreprise Ricard in the Cinéphémère, located on Avenue Winston Churchill.